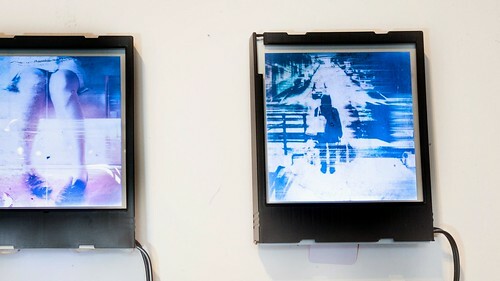 I had so much fun at the opening reception for my ANALOG:GLITCH show at Photobooth last week. I saw a lot of friends, sold a few pieces (! ), drank, and enjoyed the awesome spread that The Galley provided. The show (and Photobooth itself) are closing this Sunday, so you still have a few more days to see the work. As mentioned before, I’ve been working on this show for a couple years, and it feels amazing to have everything come together so well in the end. It’s funny, but after thinking about the digital side of the pieces for long, I was so surprised to find so much room left for experimentation on the physical side too. I had built a reputation for my daily app experiment project, but never had much experience with the world of instant film until this year. I really enjoyed how well using expired or damaged film looked with the harsh glitched out imagery. I froze film, to create a cracked effect on the film, and stacked images together to form larger pieces. I had gone from thinking of the Instant Lab as a way to print my film to thinking of it as part of the creative process. By far my favorite instant film mash up were the light boxes we created for the show. When I noticed that each pack of instant film comes inside a cart with a small battery in it (a leftover from the older days of Polaroid cameras and a disposable culture), I thought it would be awesome to convert the cart into a self contained back-lit frame. Luckily my friend Jon happens to be a lighting expert and was able to help out with this project… I couldn’t have done it without him. The first step of the boxes was creating the transparencies. These were made by taking the black piece off of the back of a your instant film, which reveals a layer of opaque stuff right behind your film. Removing this goop was the trickiest step of the process. You need to get it wet enough to come off, but if the gel beneath it (the actual image) gets too wet it will crumple, rip, or just peel off. I found using very light washes in vinegar worked well, but took a few cycles of washing and drying before I could get a clean transparency. This step took a few hours and for some reason seemed really hit or miss from photo to photo. The only thing I can say is the fresher the photo, the better. The next step was creating the diffusers, which were made with old laptop screens. We took apart some broken laptops and ditched the pixel screen, leaving a layer of acrylic, some thin sheets of lenticular film, and usually a white reflective surface on the back. I used a table-saw to cut the acrylic into shape, and used hobby knifes for everything else. 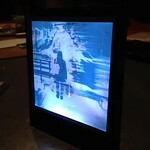 The acrylic had little white dots silk-screened on the back of it, to reflect light. The further from the light source, the thicker the dots became. The lenticular sheets were used to spread the light out. One sheet had a vertical spread, the other was horizontal. 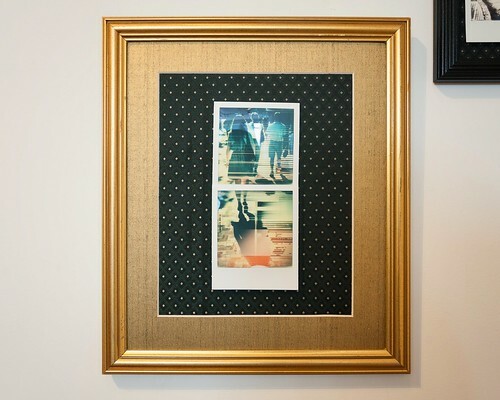 All of these pieces sit behind the transparency, and we put one more clear sheet of acrylic in front of the Polaroid to keep it pressed flat in the front. We slid all these parts into the old film carts and used a small spring to keep them pressed firmly towards the front opening. This left just enough space to place three small LEDs at the bottom of the case with a wire running out. If it isn’t clear, I have to give props again to Jon for all his help with this. I had just assumed I could put a few LEDs behind the film and be fine, but Jon taught me to put the light at the base of the acrylic and have it spread evenly throughout. Due to lack of time, we decided to just use an AC adapter to power the cases, rather than using the batteries in the packs. Now that we’ve proven the concept though, I believe it wouldn’t be too much harder to make more in the future that took advantage of the built in power. Maybe even designing a simple circuit board to slide into a cart with no soldering required. As mentioned before, you only have a few days left to see the work at Photobooth, so check it out if you can. Big thanks to Vince at Photobooth, Jon Foote, Movax at Decim8, Justin at The Galley, Shalaco, and Impossible Project for their help with this project. It’s been a fantastic experience.